The History of Finland by Mauri Kunnas is a masterpiece that joins the ranks of The Seven Dog Brothers and Canine Kalevala. 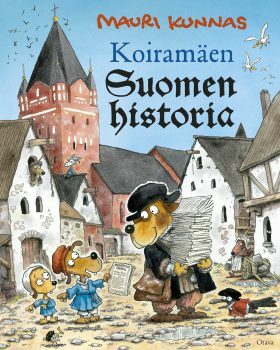 This unique picture book illustrates Finnish history from the 16th to the 19th century, introducing significant moments and characters as well as many amusing anecdotes and ordinary people through which Kunnas paints a picture of the multifaceted phases of Finnish history. The History of Finland was the best-selling book in Finland across all genres in 2017 with record-breaking 166,000 copies sold. The book also gained the first Finlandia Prize nomination for Mauri Kunnas. The rights have been sold in Swedish and Estonian.